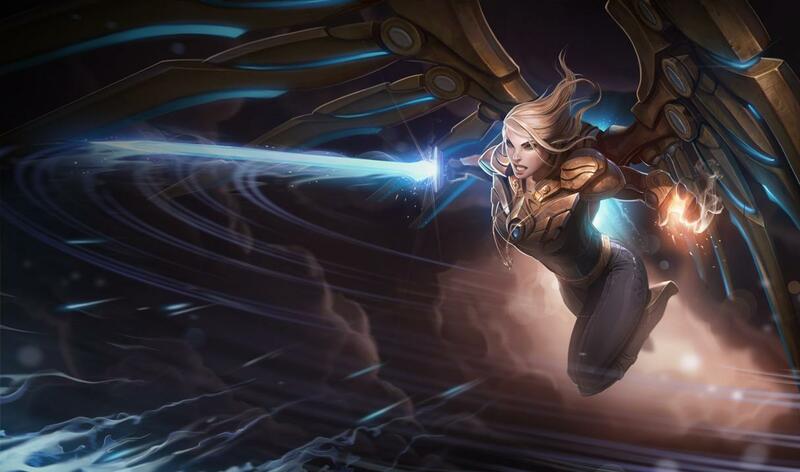 So I've been spending quite a while on a cosplay: Aether Wing Kayle from League of Legends, thought I'd post it up since I mentioned it a few times. Isn't 100% complete, but a fair way there. 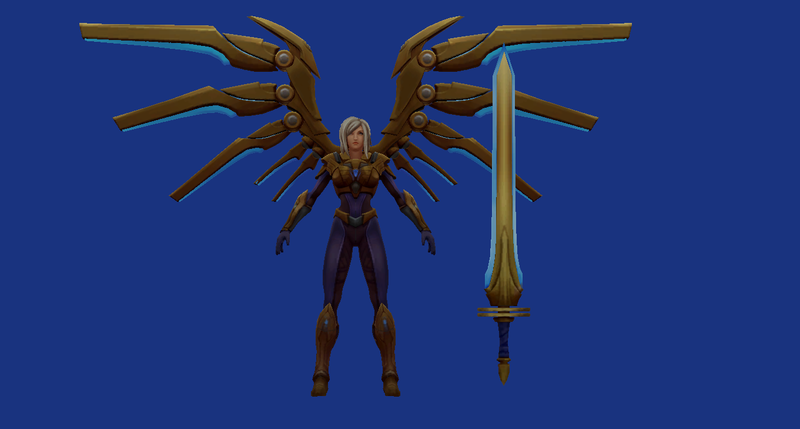 The wings are motorized to raise/lower laterally. The wing top sections rotate laterally. 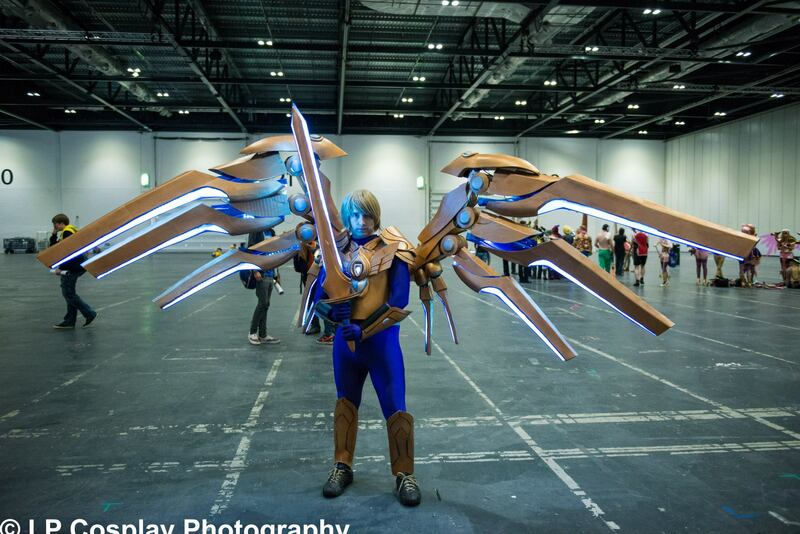 The entire wings rotate backwards behind me (actually got broken before I could demo it). And the 4 small "feathers" rotate as well. Has around 600 LEDs in total. Motors, lightning and servos controlled by an arduino mega with around 1000 lines of code. Final version will have the end sections of the "feathers" extend outwards. 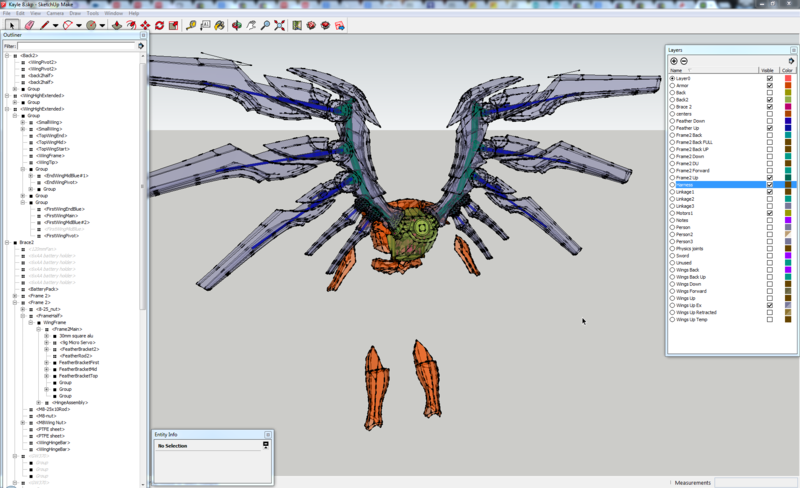 Sample picture of the 3D model in XRay+wireframe mode coloured by layer. - This gives an idea of the complexity of the model, which still doesn't display it all. The video of it that went viral showing some of the mechanics. Last edited by elminster on Tue Sep 27, 2016 5:42 am UTC, edited 4 times in total. Jiminy jumpin' Jehoshaphat, that is a piece of work. Congratulations. Do you have a making-of website for it? I'd like to know more about the materials you used to create it and the process you followed to design it. Is this something you do professionally as well? Something that elaborate looks like it'd be very difficult for someone to do unless they had some sort of professional background. I make elaborate Halloween costumes every year (spend a month or two on each), but I've never done anything motorized. FWIW, I can't link to it yet because I'm a newbie, but if you google "g42 jonsnow" you'll find my website where you can see the sort of costumes that I make. When you add motorized movements to your outfits, do you have to develop them from scratch and do soldering and the like or are there programmable systems that you could get off the shelf? Preface: This particular costume much harder than it would appear (Despite appearing hard already) largely due to accuracy (This was aimed to be as accurate as possible above all else), space constraints (The wings are proportionally MASSIVE compared to the back section, EVEN for wings 1/4 their size), money, weight, and tool constraints (I don't have a workshop, "beginner tools" is what I'd use to describe what I have). Simplified design, less accurate ones, less mobility, more tools (this REALLY needs a workshop to do), more money, more knowledge/experience (First time doing 95% of this), etc would have made it notably easier. The mechanical aspect made it over 10x harder to make, if it were fixed, I'd rate it "quite difficult", trying what I'm aiming for I'd rate "extremely difficult". This is also my first, so I've not had a chance to evaluate all methods fully. Eva foam over aluminium frame construction is great for large scale, but requires proper tools. Aluminium alloys are stronger than you'd think, I used 2-3mm thick in places where 1 or 1.5mm would have done. Tracing paper as diffuser behind acrylic worked better than expected. Contact adhesive to glue foam it absolutely brilliant, but takes a more practice than you'd think to get it perfect. Use a ceramic sharpening rod to keep disposable box-cutter blades sharper for longer (I would have gone through over 60 blades if not for honing). Lipo batteries this powerful can output over 200amps, instantly turning small wires to flames, so be careful. I don't have one at the moment, although I've been asked quite a bit, but still deciding if I should start doing it. This is my first, so I've not got any place to post them. Square tube aluminium for most of the frame (1.5 and 2mm thick walls, 20,25,30mm square); Sheet aluminium (1.5, 2, and 2.5 mm thick), 2 large aluminium bars for main wing cross, 10mm aluminium round tube to support wings. 5x 400ml spray cans of primer (proved to not be enough), 5x 400ml spray cans of elegant copper (Note: Actually looks closer to gold, which was intended. I didn't want a yellow gold look), 5x satin clear coat spray, tubes of black and silver acrylic paints. 4x4 touch pad to control different aspects (Lighting mode, opening/closing, pulsing speed, raising/lowering, enabling/disabling servos,etc. Measure parts in 3d and transfer to foam while taking into account heat forming, offsets, etc. Note: The majority of full costumes work from premade templates, mine had never been done like this before, and contains large number of organic curves. Every edge was measured and adjusted to compensate for 3d molding largely through estimation, which means most parts are within 5%. This requires a very good ability to visualize working from a 3d to 2d then back to 3d via molding/bending/etc. A lot of costumes are done with flat surfaces which are much easier. Heat seal foam, lightly sand, Mod podge coat, sand, 3 more coats, sand, prime, sand, paint, clear coat. I would give more, but trying to list 1000+ steps. I can't really list all the sources, as it's over 100 hours of researching, but can give some specifics if needed. I have no professional background in any aspect of it, except programming and even then the language is actually a bit different to what I'm used to. The amount of knowledge required to do this is in the order of 2 years of a university degree. I just happen to already know quite a bit about physics, electronics, computer stuff, material engineering, parts manufacturing, etc through curiosity, but no where near enough, so it required a lot of research. For a non-professional, non-experienced average person I'd rate this project about 9-10 out of 10 for difficulty. I happen to know enough and have the mindset to do this kind of thing, and exceptionally good at DIY-type tasks, it would be impossible otherwise. Ah yeah I've found them, pretty hillarious ones. It was designed to be motorized. I chose the actions I wanted it to do and designed the frame accordingly. The frame and mechanics designs were done from scratch, none of the designs on the internet would work for mine since it's very unique limitations. 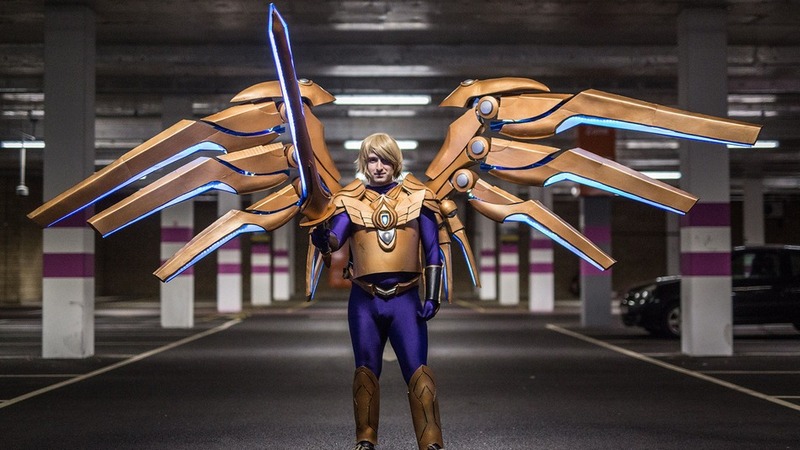 In fact, most wings even 1/4 of the size had larger connecting areas. Honestly, adding basic motorization on very low load aspects is fairly simple, the hard part about that is the hinges and linkages. Heavy load, multiple joint motions with strict space requirements make it MANY times harder. Example: If you want little flaps to move. I'd do it with a battery (Lipo if lots of power required or weight limited), voltage regulator, arduino (Anyone would do, although the smallest ones do need separate programmers since they don't have usb), servos, a hinge on the joint, a little connecting arm, wires, buttons or sensors to control it. That could be added to an existing design fairly quickly with some knowledge.